Topics: Everyday Transport, and Upcoming Events. 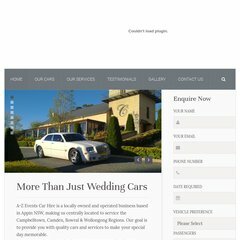 a-zeventsweddingcars.c.. Our Cars | A-Z Events Wedding Car Hire in the Macarthur and Bowral .. There are 2 Nameservers, ns2.azureushosting.com, and ns1.azureushosting.com. It is hosted by Theplanet.com Internet Services Inc (Texas, Houston,) using Apache/2 web server. The programming language environment is PHP/5.2.17. PING (174.121.217.21) 56(84) bytes of data.